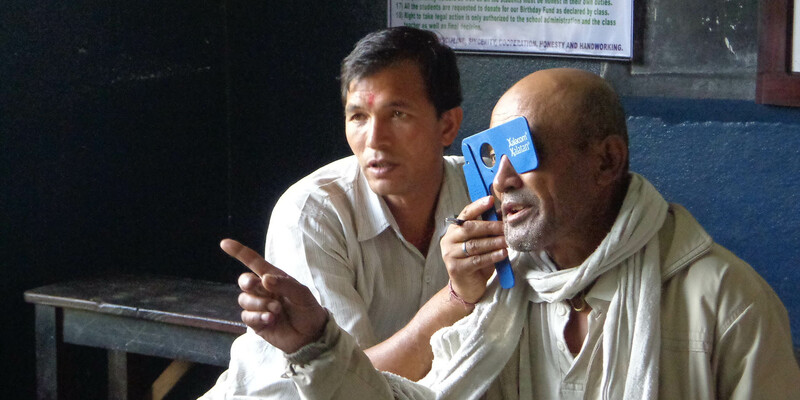 Help us restore eyesight to 100,000 people! 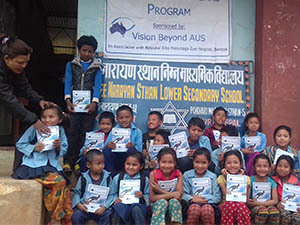 The Reiyukai Eiko Masunaga Eye Hospital (REMEH), occasionally conducts eyesight-screening clinics for school children in remote areas of Nepal. VBA now supports a programme with a target of 10,000 children who would be eligible for free eye testing and screening, followed by prescription spectacles or surgery as required. Maya Tamang is a sixty year old widow staying alone on her own in Jyamdi. She could not see with her both eyes well. 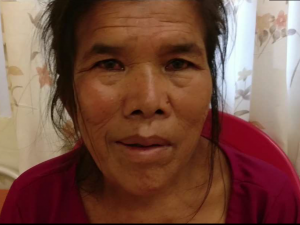 It is strange how she managed to stay alive in a very sparsely populated Tamang settlement. Few times in a year her younger sister would come to help her, but as she has her own family responsibilities she too would have to go back to her own home. The villagers would take care of her. They would alternately bring food to her, but most often, there was this kid who liked to help her a lot. So he used to come to her house and cook food for her. It had already been 5 years and she managed to survive in the same method. Few times, she used to sleep with a hungry stomach and many a time she used to improvise with stale leftovers of the food brought by the neighbors, especially during the farming seasons, when everybody in the villagers would go in the field and is busy in the harvest. After five years, the kid becomes young and he questions the adults—why does the woman have to live like this? Is not there any solution for her? The blithesome countrymen didn’t give much attention to his questions only to get him more proactive. He wanted the woman to get her to the hospital. Sadly, he had no money and he did not know where the hospital was. The boy was 14 years old. The boy told his family to help her. Since he frequently brawled about this, the father also became attentive toward her. He started to look the woman more kinder way. They were planning to take her to the hospital the other week. One day the woman sprained her leg while she was roaming door to door begging. Her mobility was then highly restricted. She used to stay indoors all day weeping. We were informed about the woman while we were in that area for surveying if a camp was feasible. We went to her home and found that she had had cataracts in the both eyes. While getting back, we brought the woman with the father of the very kid as a caretaker. We could not meet the kid as he had gone to school. Her both eyes were operated one day after other. 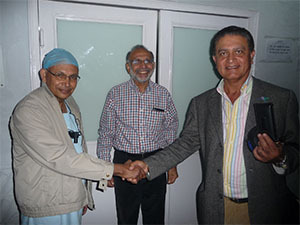 Vision Beyond AUS bore all the costs for the cataract surgeries. Her vision was completely restored. She was very happy and she said she could not pay back the debt all her life time. The old man even took her to another hospital for the sprained leg. Now, she does not have to go begging to get her ends meet. She doesn’t even goes to her neighbors for help. This is only one example of many others of Vision Beyond AUS’s contribution in making Nepalese lives better with the restored vision. Roslyn McLeod, the President of The Rotary Club of Sydney in 2011, asked Indy Singh to find a project that would build “international bridges of friendship”. Indy knew of the work of two Australian eye surgeons, Dr Jay Chandra and Dr Purnima Roy, in the small town of Rishikesh, in Northern India. They had travelled there, with a team of volunteers to conduct free eye surgery clinics for the desperately poor of the area.